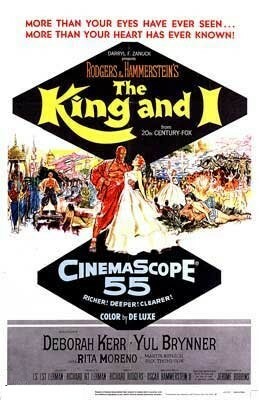 I had initially thought I would save watching the acclaimed 1956 movie version of The King and I for the end of my trip through this wormhole devoted to the R&H classic, but with no other activities planned last night, a bf as willing as he’d ever be to sit through it, and the blu ray tantalizingly sitting on the shelf, we hunkered down for a technicolor trip to Siam. The movie is particularly notable for keeping three key elements from the original Broadway production: Yul Brynner’s performance (for which he won a Tony and an Oscar), costume designer Irene Sharaff (also receiving a Tony/Oscar combo), and Jerome Robbins’ choreography. The presentation of the wildly creative and effective “Small House of Uncle Thomas Ballet” in (more or less) its complete Broadway form, featuring not only the peerless work Robbins and Sharaff but also that of original Broadway dance music arranger Trude Rittman, is not only one of the film’s greatest assets but also one of Hollywood’s most generous important preservations of Broadway staging. Robbins’ subtler work in “Getting to Know You”–in which a demonstration of a very-English-minuet is demonstrated by Anna and then replicated by Lady Thiang (played by Terry Saunders from the National Tour) is followed by a presentation of a more traditionally Siamese fan dance by one of the King’s wives which is then replicated by Anna–is equally irreplaceable and utterly delightful. Sharaff’s costumes, in addition to their opulence and style, should also be credited for their large part in telling the story with their striking illustration of the films many cultural conflicts (not just East vs. West, but the entire hierarchy within the palace and among the wives). I’ll close by adding that the blu ray I have is loaded with special features including a number of segments looking back on the history of the show and the making of the movie, some live television performances with Yul Bynner and Patricia Morison (from the same tour that boasted the film’s Lady Thiang), and, most intriguingly, the pilot for the perhaps ill conceived 1972 television series Anna and the King, which featured Brynner returning to the role of King a few years before he began the decade of “return engagements” in the musical that would define the last phase of his career (he died two months after his final performance on Broadway).